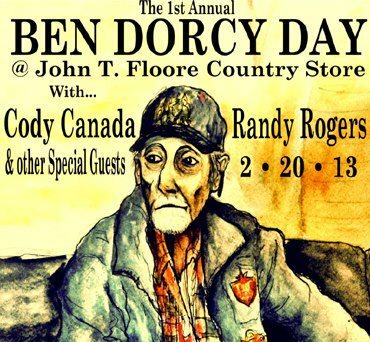 Ben “Lovey” Dorcy is the world’s “oldest roadie” and an icon in Texas Music folklore. He’s assisted Willie Nelson, Waylon Jennings, Johnny Cash, John Wayne, Buck Owens and closer to home Pat Green, Randy Rogers Band, Cory Morrow and Josh Abbott Band. There isn’t much Lovey hasn’t seen, done or helped make happen. With that in mind, his friends have decided to show him the love this Wednesday at Floore’s Country Store in Helotes. Come celebrate the man and the music he’s supported for all these years. “Ben Dorcy, the world’s oldest band boy, was with us this trip. Hes one hard-working man. I told him tonight that he was insured by the company I’ve formed, with a two-dollar deductible. He wants a fifty-dollar deductible. Somebody essentially help to make severely articles I’d state. That is the very first time I frequented your website page and thus far? I surprised with the analysis you made to create this actual submit extraordinary. Magnificent activity! I’ve been surfing on-line greater than 3 hours these days, but I never found any fascinating article like yours. It is pretty worth enough for me. Personally, if all webmasters and bloggers made excellent content as you did, the web might be much more useful than ever before. Thank you so much for giving everyone an exceptionally terrific possiblity to read articles and blog posts from this web site. It’s usually so ideal and also packed with a lot of fun for me and my office mates to visit the blog nearly three times in one week to learn the newest guidance you have got. And lastly, we are certainly pleased considering the stunning tactics you serve. Some 1 facts in this article are without a doubt the simplest I have ever had. I am not certain the place you’re getting your information, but great topic. I needs to spend some time learning much more or working out more. Thank you for great info I used to be looking for this info for my mission.